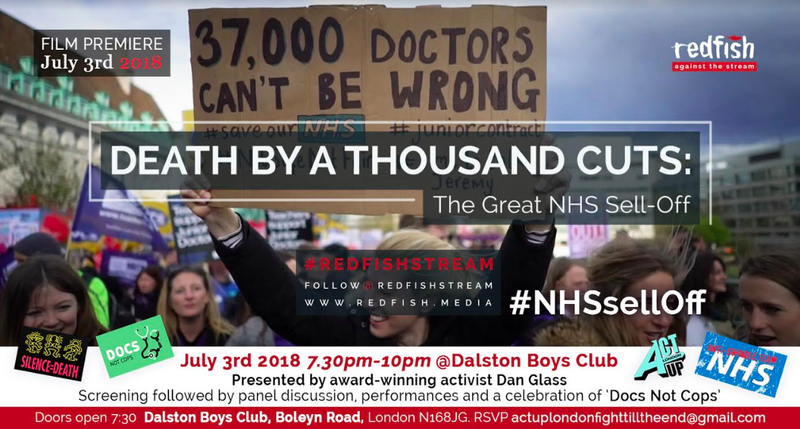 To mark the 70th anniversary of the founding of the NHS, award-winning healthcare activist Dan Glass teamed up with redfish to present a grassroots report on how tax-shy profiteers are trying to seize control of public healthcare services and what we can do to stop them. The launch screening will be held at Dalston Boys on club at 7.30pm on Tuesday July 3rd (1). ‘’For the last 70 years the NHS has been there for the most in-need in our society. HOW TO BOOK – RSVP at actuplondonfighttilltheend@gmail.com. There are very limited spaces so for all press and public tickets please email actuplondonfighttilltheend@gmail.com. Tickets are free. Book at Outsavvy here – facebook page here. ACCESS – Dalston Boys Club has ramp access. Unfortunately the toilets aren’t accessible but we have arranged access in the building next door where assistance will be on hand.